Infiniti has introduced an improved FX which gets subtle exterior styling changes. The new model is on sale now with prices unchanged from before meaning the FX37 costs from £46,750 while the FX30d starts at £46,840. 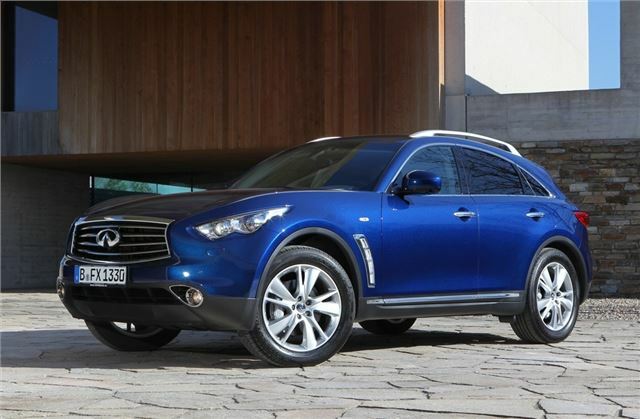 The bold FX has always stood out from other SUVs so Infiniti hasn't changed the outside too much. At the front there are subtle changes to the grille and a redesigned bumper. GT and GT Premium models get a new five-spoke 20-inch alloy wheel plus there is a new paint colour - Iridium Blue - which is shown on the car pictured above. There is also a new Graphite Shadow colour. As before there are four trim levels - GT, GT Premium, S and S Premium. The Premium trim is designed to be a luxury trim while the S is more sporty, getting Rear Active Steering (except on the FX37) and continuous damping control. S models also have 21-inch wheels, smoked headlights and red S badging. Premium versions of both the GT and the S come with advanced navigation and entertainment systems, along with a Lane Departure Prevention system. There are two options - metallic paint priced at £760 and a £2400 Multimedia pack made up of a 30GB HDD navigation system along with a Bose Premium Sound System, although this is standard on Premium models. The engine line-up consists of the FX37 which is powered by a V6 petrol producing 320PS. The FX30d makes more sense though with its impressive six-cylinder diesel engine producing 550Nm of torque and capable of a claimed 31.4mpg average. The top model is the FX50 which has a 5.0-litre V8 with 390PS. All models come with an intelligent torque-sensing all-wheel-drive system as well as a seven-speed automatic transmission.